I’m a big fan of oatmeal cookies. They always have a great texture, have a bit of bulk so they stick with you, and they’re often more nutritious than your average cookies thanks to the rolled oats. 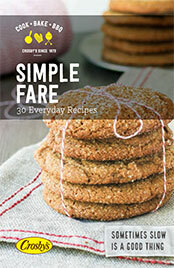 This recipe is adapted from the book “Canadian Living 150 essential whole grain recipes”. The original is an old recipe from the First World War, popular because the cookies kept well in the trenches. I swapped molasses for the golden syrup originally called for and I added flax meal for bulk and nutrition. The result is a delightfully chewy cookie that’s crispy around the edges. These cookies travel well so make a great lunchbox cookie. Use old fashioned rolled oats for the best texture and more nutrients. In a small pot melt the butter along with the molasses and water. Stir liquid mixture into the dry ingredients and mix well. Drop by tablespoonful on a parchment lined baking sheet. Bake at 350 F for 12-15 minutes until golden around the edges. 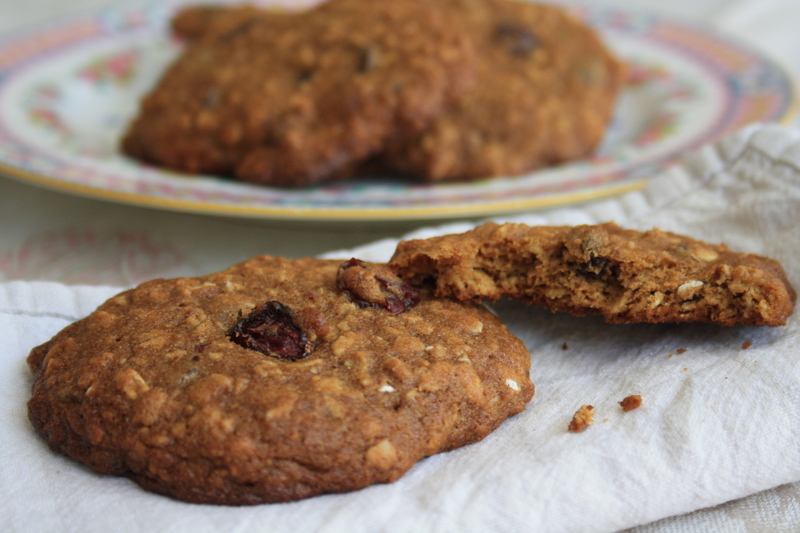 Like chocolat chips and dried cranberries in your oatmeal cookies? Try our molasses oatmeal cookies. 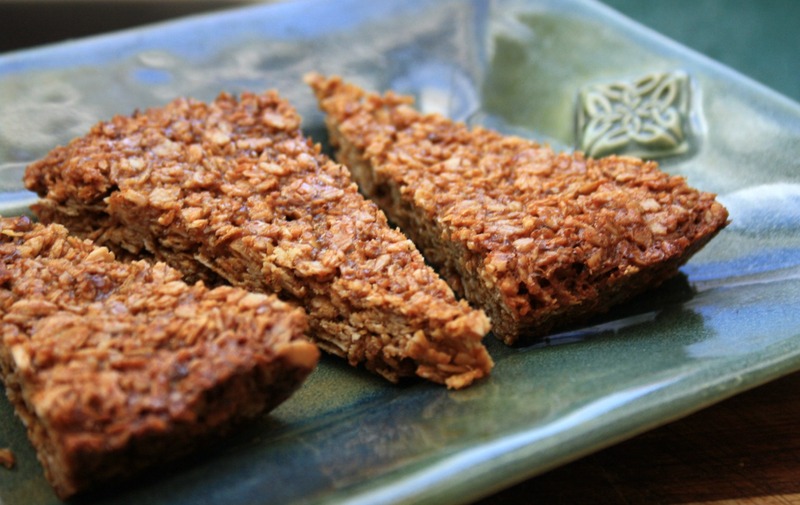 Dessicated coconut is finely textured and adds to the delicious chewiness of these cookies. Glad you’re enjoying them!  Your Family Favourites cookbook will arrive in a week or two. Is there no egg in this recipe and could I substitute milk for the water? Hi Judith, No egg, which is part of why they’re so chewy. And I’d say substituting milk for the water is worth a try. Let me know how it works out! Hi Rhonda, Raisins sound great. Thanks for the suggestion! Linda, What a great recipe! I added finely chopped candied ginger it goes wll with the molasses and coconut. Candied ginger, great suggestion. Thanks! Dear Priscilla, Thanks! If you’re curious about variations, one reader added chopped candied ginger to this recipe and another added chocolate chips. Both sound good to me! There is no baking powder or baking soda. Is that a mistake? I know it seems strange but there really isn’t any levening agent in the recipe. It makes them extra chewy. This is very good and very addicting. They would work well with gluten-free flour. Enjoy! what can you use instead of Molasses? You could use honey or maple syrup, or golden syrup. I think that the original recipe called for golden syrup. Can I use Almond flour instead of the flour? They would be delicious with almond flour. In fact, I would love to try making them that way. Thanks for the suggestion! So now you have inspired me to try your version. Thanks for the tip about reducing the oven temperature. Thanks very much Bridget. Trying t do this is very taxing sometimes because of the pain but to many side effects from meds. So trying weight free route. Can’t hurt right? Thanks again Tracy B.
Hi Joan, I wish I could figure out why they didn’t work for you. I feel badly — it’s awful to have to throw something out. I hope you have better luck with other cookie recipes on the site.